#1-02 Brunswick antique pool table in eight-foot size. Solid quarter-sawn oak construction with fluted legs and decorative moldings at each corner of the cabinet. 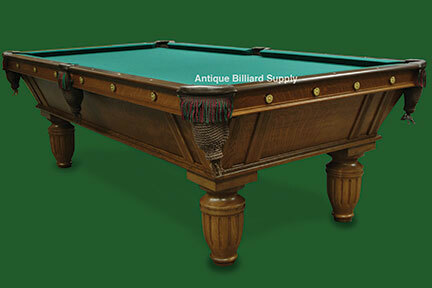 Medium brown finish to compliment a wide variety of billiard room furnishings. Four-piece slate playing surface. Ready for delivery.